So said Claressa Shields, two time Olympic Gold medalist and current IBF, WBA, and WBC women’s middleweight champion. Shields was on a conference call to promote this Saturday night’s title unification bout against WBO middleweight champion Christina Hammer. The bout is being promoted as the biggest women’s fight in boxing history. That may or may not be true, but the 8-0 Shields, and the 24-0 longtime champ Hammer are most certainly at the top of the pecking order. “We both talk trash,” Shields admitted. “I can say I don’t like her as much as she doesn’t like me. But at the end of the day, after the fight, I’ll give as much sportsmanship as I can.” Both fighters made it clear that their fight is nothing if not a huge event. Undefeated, young, and decorated, both athletes realize that there’s a lot of bragging rights that come with winning this weekend, though both are already acclaimed in their own right. 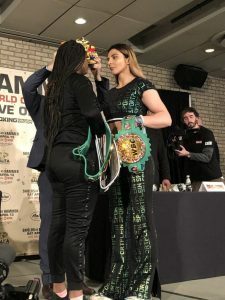 “Just keep being me,” Shields said in response to the assertion she’s “the face of women’s boxing.” Shields mentioned a piece of advice Andre Ward gave to her: “Just be who you are.” If being who she is brings about a win on Saturday, it will be sound advice indeed. Although Shields may come across as rougher around the edges, Hammer showed that she can subtly and aggressively press buttons. For it was Hammer who interrupted while Shields was answering a question, then laughed when Shields responded.